These grapes have been made with bread dough. 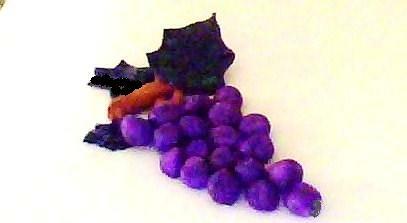 Make small balls for grapes , the purple color can be mixed in the dough . Make leaves , branch and allow to dry . When all the items have dried properly stick them in a natural formation. Please see the tutorial for Bread craft recipe in the blog.